Located on the southern coast of China, Guangdong is the country’s most populous and rich province. It has 95.4 million inhabitants and provides one-eighth of the national GDP. A key development feature of Guangdong has been “processing trade”, which has allowed companies to profit from importing materials, assembling goods and exporting them via Hong Kong, China. The recent economic crisis has had a strong impact on the province, although Guangdong also faces in-depth structural problems. Growing labour costs and strain on land availability have increasingly challenged the province’s traditional model of development, as have new competitors in China and abroad. Meanwhile, regional disparities within the province have increased, with a high concentration of economic activities and foreign direct investment in the Pearl River Delta area, an agglomeration of nine prefectures of 47.7 million inhabitants that represents 79.4% of the province’s total GDP. This review assesses Guangdong’s current approach to economic development. The province is focusing on industrial policies primarily aimed at heavy manufacturing industries (e.g. automobile, shipbuilding, petrochemicals) and supported by investment in hard infrastructure transport projects and energy supply, along with the implementation of the “Double Relocation” policies intended to move lower value-added factories to lagging regions through incentive mechanisms like industrial parks. The review discusses how some principles of the OECD regional paradigm could help Guangdong. It also addresses the huge environmental challenges that the province is facing and explores the opportunity for developing a green growth strategy. 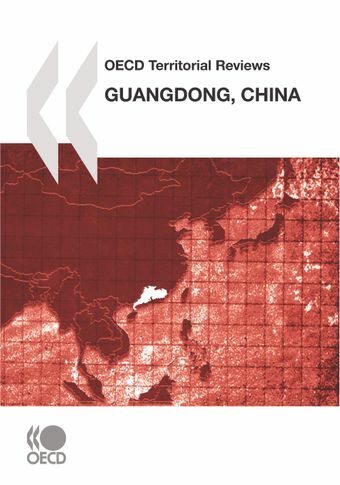 Strategies to improve Guangdong’s governance are analysed as well, with particular attention paid to co-ordination issues within the Pearl River Delta.The Territorial Review of Guangdong is integrated into a series of thematic reviews on regions undertaken by the OECD Territorial Development Policy Committee. The overall aim of these case studies is to draw and disseminate horizontal policy recommendations for regional and national governments.